The journey is always more beautiful than the destination. The person who said this, might not have traveled home in crowded Indian Railway compartment. For the majority of us who come from small towns or remote areas, air connectivity is still not direct. Or even if it is, the pocket screams looking at the price of the tickets. It automatically becomes a good idea to travel by train as the price is comparatively less in the sleeper compartment. The train journey in itself is a work of art in India. And if you fall into the bracket of people who need to be in the train for an overnight journey, you are in for a treat. It is sometimes so unbelievable in terms of volumes of people traveling that the Discovery channel featured one particular train journey in India as one of the most dangerous ones across the globe. This becomes relatable now, especially when the compartment is overflowing with people trying to get home in festive times. The railway compartment in a sleeper section has windows that can be opened and fans overheard that can lend a less than accountable air flow to the people. It does make a terrific whirring noise though and is usually used to store footwear of people from the top berth. So, the airflow is never enough for this category of people. They make it a point to stand at the door clasping the door handle and let the breeze from outside calm them down. This also includes getting down at every station and then feeling ardent pride in catching the slow moving train. 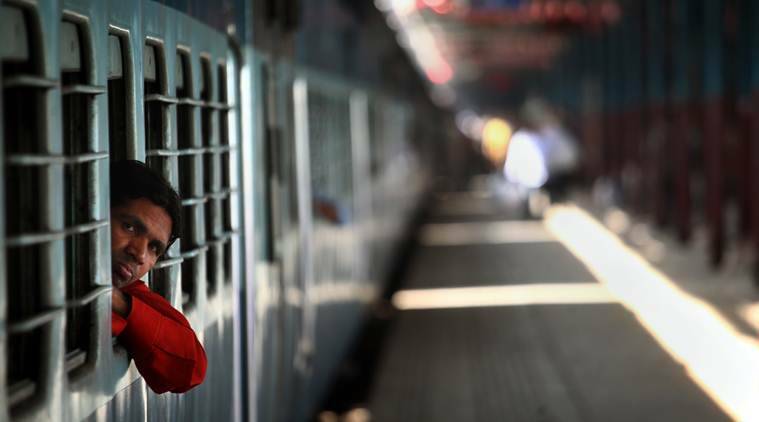 Indian Railways offers an option to book your tickets four months in advance. But with so many people and so many impromptu plans, the seats are never enough. A sizeable population of travelers is left with either no ticket or a waitlisted one. No sooner does the train arrive at the station, they began looking for the ticket collector as if he is going to distribute free tickets. What ensues then, is nothing short of a comic ride. They follow the ticket collector like a bunch of mice following a bagpiper. Most of the times, the ticket collector can arrange for seats, but with more stringent measures in place, the waitlisted ticket holder is mostly at the mercy of passengers who can lend a seat out of sympathy. For most folks, traveling by railways means gorging on the food that keeps coming up in the compartments. This includes sliced cucumber, packeted snacks, fruits with chaat masala and what not. They haggle with the vendors as if their life depends on it and make sure to throw the remains somewhere within the trains. No wonder the rat community has an affectionate connection with railway tracks and compartments. The usual convention also dictates getting down at a stop, running to the thela at the station and shouting, “Please hurry with the order, the train will leave”. The snacking community is so strong that if you pass by a particular station and don’t have the famed snack, you will probably be sneered at. Your journey will be declared a waste and you will probably be red-faced at the tea conversations at work. 4. Can we please exchange the seats? Booking multiple tickets at one time doesn’t necessarily mean you will get them together in terms of seating. This proves to be a major conundrum for people who travel in groups or families or even couples. They tend to start arranging/exchanging seats as soon as they are in the compartment. You go there, he will come here, we are still this station so after that, you can come back to your original seat. It all becomes part of a complex algorithm and needless to say, the solo traveler ends up changing at least 2-3 berths on a long journey. As the saying in an advert goes, “Thoda adjust karo na”. There are families who travel in large numbers and then obviously all the women in the group have brought home prepared food. The idea here is to avoid unhygienic food, yet make sure that traveling doesn’t upset the daily food intake. That being said, at dinner time, large tiffin boxes appear out of nowhere. Quickly food is served in paper plates/newspapers and people from the group start moving between the different sections with food plates. There was a time I remember when some family had brought panipuri and chaat along in the journey. Kids were running around complaining they hadn’t had a second helping of papdi chaat. It is amazing how the compartment can turn into a mobile kitchen or roadside thela in a matter of minutes. This is the most common opening line for any mid aged male that you will find, trying to start a conversation with someone. They are usually bored after reading the papers and looking out the window. So they try and strike a chat with someone which our fellow travelers usually comply with. The discussion usually follows a set pattern, discussions around jobs, education, government failures, cricket panel topics and of course property being a safe investment. One major topic of discussion these days, however, is the complaint of kids settling abroad which usually takes an emotional detour. But then someone’s kid walks up in squeaky noise making shoes and the conversation takes the route “Oh so cute”. All in all, the journey is more beautiful than the destination, sometimes irritating and annoying too. You will end up making friends, acquaintances, changing seats and eating a lot more than planned. The Indian railway compartment is in itself, a laboratory to study and understand various human characteristics. So be observant the next time you travel.